I really struggle styling my hair, it’s so thick and long and this makes it tough to manage. 99% of the time i look like Worzel Gummidge. I love getting my mane sorted out by a professional. It’s such a treat. 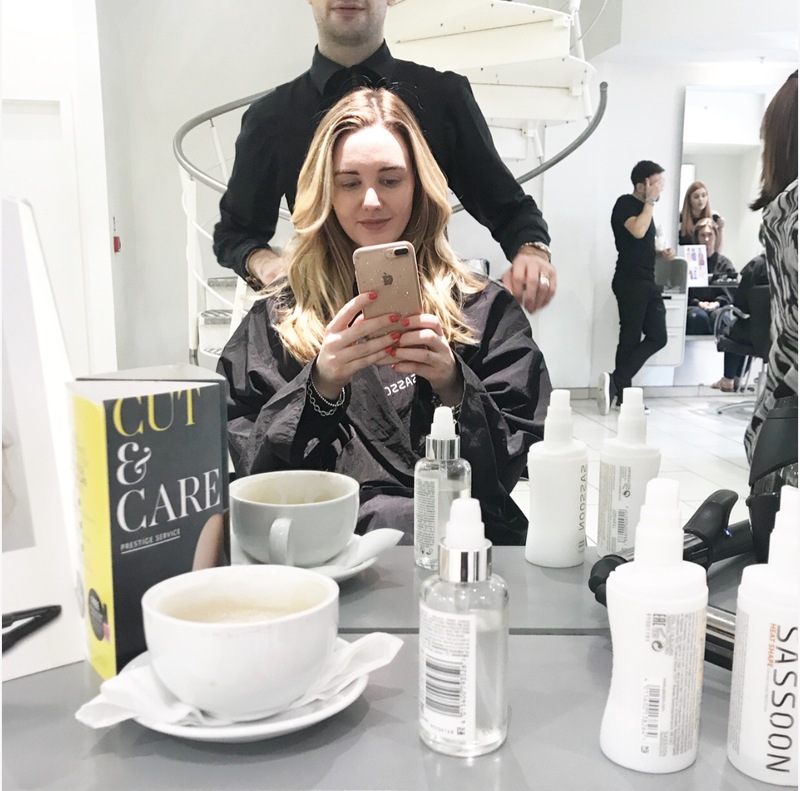 When I was invited along to the Sassoon salon in the Met Quarter in Liverpool to receive a treatment called “Cut Prestige” I basically ran there. The salon is located upstairs, it’s bright and airy, and it has a laid back, but professional vibe. There was a mix up regarding my appointment. Don’t you just hate that? My hair was hidden under a cap, and i felt like crying. (Drama queen, yes, i know). But I couldn’t fault the staff at Sassoon, they handled the mix-up incredibly well. Within 5 minutes i had a cuppa in my hand and was talking to a lovely chap called Adam, he was chatty, friendly and very passionate and knowledgable in the ole hair department. We discussed any issues i would like to address, or any styles i had in mind. Adam suggested that I have more choppy style layers cut in, whilst keeping my length. He recognised that my hair was incredibly dry, and suggested I have a oil conditioning treatment to try and rectify this. My hair was shampooed twice, and I received a relaxing head massage. An oil conditioning treatment was then applied to my hair, a shower cap over, and i sat under a very snazzy heating device for ten minutes. I was told that the Sassoon Luxe Oil Conditioning Treatment penetrates the hair shaft, and lasts for 12 washes. The treatment prevents damage by hydrating and nourishing the hair. This results in less split ends, frizz, flyways and the hair appearing shinier and healthier. I was then asked if i wanted another drink or a magazine. The overall service was top notch, someone was always floating about checking in on me and the other customers, to make sure we was okay and comfortable. The oil conditioning treatment was then washed off, and my hair towel dried. Adam combed my hair and then started to cut the layers in. This took a lot longer than i anticipated, but i could tell that Adam was a perfectionist – so it was going to be worth the wait. He then sprayed the Sassoon Heat Shape spray all over my hair to protect it, and then the Sassoon Halo Hydrate. The Halo Hydrate is a leave in conditioner, and it is suitable for all hair types. Adam then dried my hair, brushing the hair over to one side, to create volume and body. He then wanded sections with a hair wand, and ran his fingers through my hair to create loose waves. My hair felt much lighter, and as you can see it looks so much more healthier. 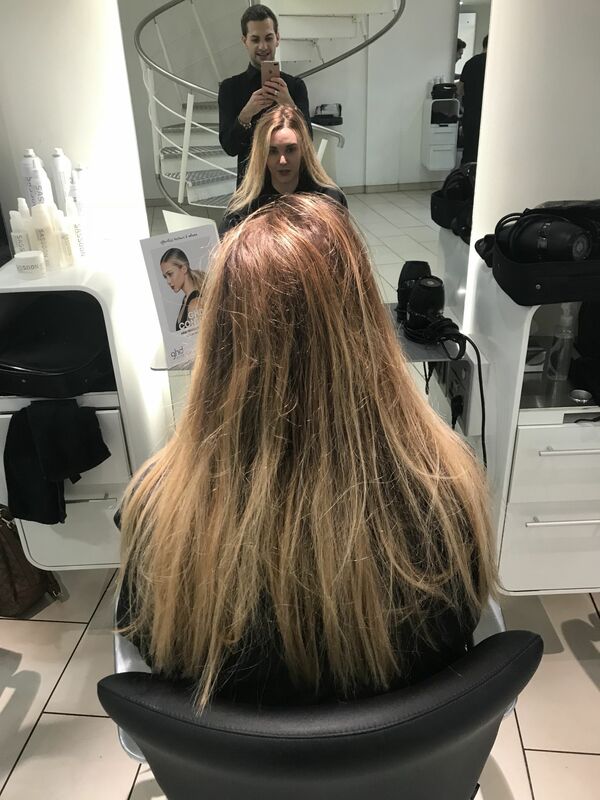 The tone of my hair colour appeared more natural around the roots, and the blonde appeared a lot brighter at the ends. Due to this factor i feel this would be a fantastic treatment, to get in-between getting my colour done. 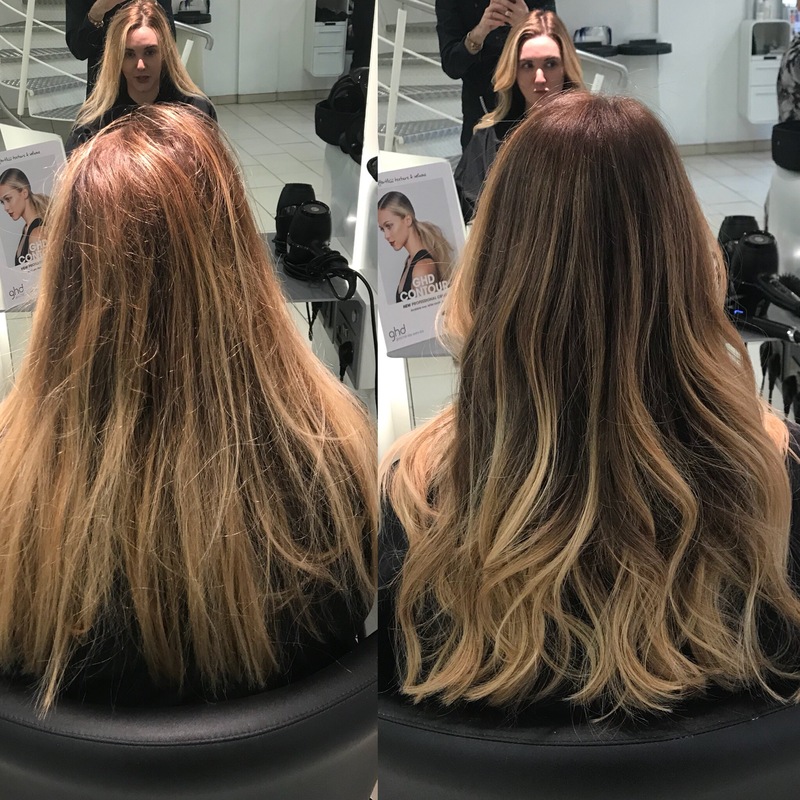 I feel the majority of us regularly get our hair coloured, cut and blown. But don’t seem to invest in hair treatments of this sort, at a salon. 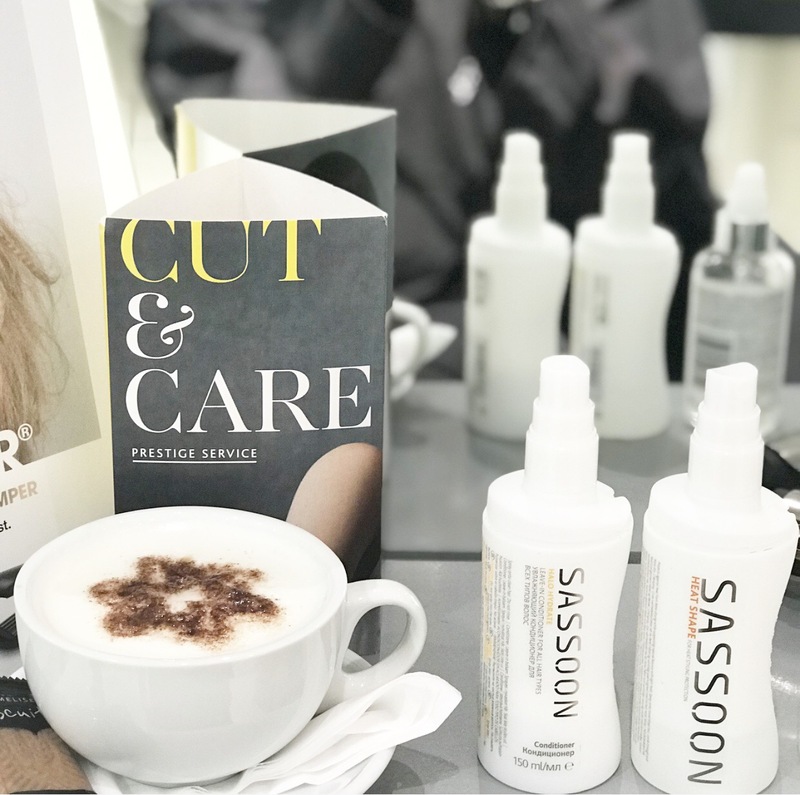 With Christmas on the horizon, i feel this would be a great gift for friends and family – as Sassoon sell gift vouchers. So if you are reading Mum, the above is a hint. Haha! *Services featured on this post are gifted. * Visit my Disclaimer here for more information.